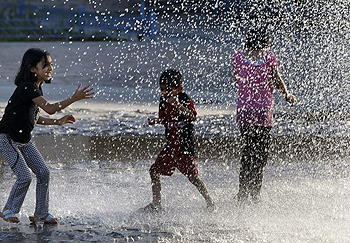 Jordanian children cool off under a fountain during an unseasonal heat wave in downtown Amman on June 15. I am a 16-year-old Arab-American. One of my parents is from Lebanon and the other from Palestine. Both live in the Middle East while I attend boarding school in the United States. Even though I always knew my own identity, I found it ironic that in the Middle East I am considered an American, while in the United States I am considered an Arab. Somewhere along the line, I feel I became lost to both lands, although in my heart and soul I feel I still belong to both. Fortunately, this combination of American and Arab cultures and traditions has created an opportunity for me to be an ambassador to both places. Drawing from this "ambassador" energy, this summer I spent a week in Jordan with Habitat for Humanity, an organization dedicated to building simple, decent, affordable housing in partnership with people in need. I helped build a home for a Jordanian family of four whose existing house consisted of only one room that, shockingly, was smaller than the size of my dorm room at school. This one room was their living room, dining room, kitchen and bathroom—all in one. As I worked in the scorching heat in northern Jordan, building walls and installing windows, I learned numerous things about myself, about others and about the simplicity of finding common ground between people from different cultures. I spent my breaks talking to this Jordanian family, their friends and their children about why I chose to work with Habitat for Humanity. These conversations grew into ones in which we discussed the similarities between our paths, cultures and lands. It was a breath of fresh air to hear about what Arab and American cultures have in common rather than to hear about all of their differences. Everyone I came across was extremely hospitable and generous. They invited me into their homes and cooked for me. They talked about the same ordinary things that families around the world talk about: children, schools, rising inflation, unemployment, peace and, most of all, hope for the future. I met Huda, a young 19 year old who was visiting her family over the summer. She, like me and many of our peers, had left home in northern Jordan to pursue a challenging education. We shared our experiences living away from home and the responsibilities that come with it. Huda is the only member of her family living outside her hometown. Due to her heavy academic load she is unable to visit her family very often. To cope with the lack of family and the distance between them, she surrounds herself with a network of close friends and mentors who act as her support group. My coping skills are no different. I rely heavily on my teachers and friends at school to be my daily support groups. To me, Huda represents my "Jordanian counterpart." Just as I take pride in my identity, each person I met was so proud to be a Jordanian. King Abdullah's picture hung in many village locations, and the locals beamed when telling me all about Queen Rania. They asked many questions about the first family in the White House, who has much in common with the young royal family in Jordan. The most valuable lesson I learned was that finding common ground between our different cultures did not require first acquiring a series of college degrees, or a myriad of other prerequisites. What was most essential was having a heart that was willing to be open toward others. An open heart can come as a result of enjoying some of the simplest things: family, food, music, art and children. I returned to the United States with a renewed interest in encouraging others to get involved in bridging gaps with other cultures. I have joined the diversity club at my school to encourage this very thing. I plan to visit Nablus in Palestine next summer looking for how I can further establish common ground with the people there. While I am of course partial to the Middle East and would like to see more interaction between Arabs and Americans, I encourage all young people to spend more time giving back to any community at home or abroad. A young mind can go a long way toward making a difference, especially one focused on the simplest things. Natasha Nassar is currently a junior in high school in Groton, Massachusetts. This article was written for the Common Ground News Service: www.commongroundnews.org.